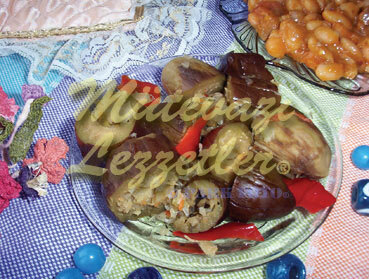 # Pell off the green leaves of eggplants, cut into a few parts without peeling its outer surface. # Put the eggplants into boiling salty water. And take out before it gets totally cooked. # Stow the not totally cooked eggplants, put some weight on them if you have. # The day after place a layer of eggplant and then a layer of red capsicums which are chopped into a few parts, and repeat this act until the jar gets full. By the way place pounded garlic between the layers. # When the jar gets full, pour 1 cup of vinegar into the jar and then fill the space with water. # Pour the mixture of vinegar and water in the jar to a bowl, add rock salt and lemon salt and mix well. # Pour the mixture again into the jar, place stems of parsley on the top. Cover the lid well. # A few days later, if the eggplants absorb all the liquid, add vinegar into the jar. # You can serve the pickle 10 days later. Note: You can add 2-3 bay leaves into eggplant pickle.